Another date for the John Godber, Peter Sansom, Helen Cross tour. Ilkley Literature Festival are promising ‘A brilliantly entertaining afternoon of readings and conversation with a trio of acclaimed writers – playwright, novelist and poet – as they talk about their relationship with the North.’ We’ll do our best! You can book here. 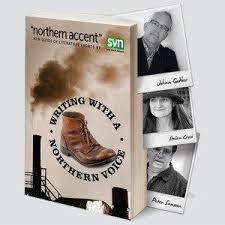 Another outing for the John Godber, Peter Sansom and Helen Cross roadshow, Writing With a Northern Voice. The events have been very popular so far! You can book here. You can listen to actress Helen Baxendale and I discussing our favourite books with Harriett Gilbert on BBC Radio 4’s A Good Read here. The selection includes a treatise on re-wilding Britain by George Monbiot (‘Feral’), a novel about the culture clash between two women from very different backgrounds, ‘The God of Chance’ by Kirsten Thorup (my choice), and an award-winning memoir, ‘The Three of Us’ by Julia Blackburn. Carol Adlam and I are working together again, this time on a new commission for the National Army Museum. Over the next eighteen months we will write, illustrate and publish a graphic anthology of new stories about women’s experiences, contemporary and historical, in the British Army. 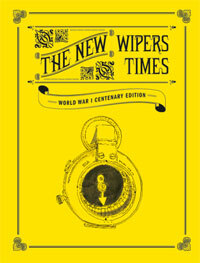 It follows on from our previous work together, on The New Wipers Times, a graphic anthology to commemorate The Wipers Times. My edition of BBC Radio 4’s Fact to Fiction will be broadcast on Saturday 6 June 2015 at 5.40pm. The play will be written during the preceding five days, as a response to the week’s news. I’m going on tour. Writing with a Northern Voice is an evening of poetry, prose and discussion, taking place at four Northern venues in March and April 2015 (with more dates to come in Spring 2016). Join me, dramatist John Godber and poet Peter Samson as we read from our work and talk about our relationships with the North and how it has shaped our work and careers. Organized by feminist group F=, ‘Women, Visibility and Playful Acts 2’ is a day of talks, performance, exhibition and making with artists, researchers and writers based or working in Leeds. Presenters include me, artist/activist Jill Gibbon, poet/playwright Rommi Smith and photographer Casey Orr. The exhibition will include work by cartoonist Jacky Fleming, posters from ‘zine Shape & Situate and new work by students in the School of Art, Architecture and Design at Leeds Beckett University. I’m running a series of four workshops over the coming year for young writers. The Young Writers’ Foundation Group is to give young writers a chance to develop their interests in creative writing across a range of styles and forms – from poetry to drama. The group will be meeting from 11am – 4pm on the following dates: Saturday 10th January, Saturday 11th April, Saturday 27th June and Saturday 12th September. Places are £80 per person for the year – a limited amount of bursaries are available, please email joanne[at]writingwestmidlands.org if you feel unable to afford the cost. Places must be booked through The Box, on 0121 245 4455 or you can book online or in person at The Box which is based at the Birmingham REP. In 2015 I will take up a Creative Writing Fellowship at the University of East Anglia. I will be teaching on the highly regarded MA Creative Writing Prose, the same course I completed in 1997. On Saturday 4 and Sunday 5 October 2014 I will be running an intensive creative writing masterclass weekend with poet Antony Dunn at the Beverley Literature Festival. The weekend will include advanced writing classes and one to one tutorials. Places are filling up quickly, and are extremely limited, so if you want to come do book soon. More details here.